CrashPlan is an online backup service that I've discussed in the past, but now there's a free version that I think you'll find interesting. Crashplan's client app is available in Mac, Linux, and Windows versions. You can download it for free, and that's all you need to start backing up data. The client will back up your data locally to hard drives or network-attached storage. The really neat thing is that you can also back up your data to a friend's computer, over the Internet, for free! To do this sort of backup, you send an email to a friend or family member, requesting permission to use their computer to store your backup files. The friend accepts the invitation, installs the Crashplan software, and adds you to his "friends" list. Now, as long you're both connected to the Internet, you can back up your data to your friend's machine. Your data is encrypted before it is transmitted to your friend's machine, so he or she won't know what you are storing on it. Of course, you'll probably return the favor, letting your friend use your empty disk space. Both of you can limit the amount of space used for backups, or end the relationship at any time. 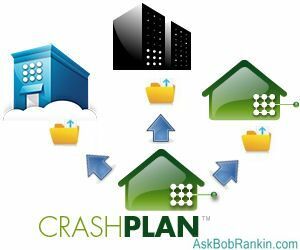 Crashplan offers its own servers to store your data, in a plan called Crashplan+. A free 30-day trial comes with 10 GB of storage space. Unlimited storage space for a single computer costs $50 per year, slightly less than MozyHome's $55. A family Crashplan+ provides unlimited storage for up to 10 computers at a cost of $120 per year. That's less than Mozy or Carbonite, but more than the $80 charged by SOS Online Backup. Crashplan can create multiple backup sets, a feature that some users find helpful. It also backs up changing files continuously (as often as every minute) and gives priority to recently changed files. Crashplan does not integrate with Windows Explorer, so there are no context menu commands or little markers indicating which files have been backed up. Of course, you can restore data from Crashplan, too. But you cannot search for a specific file or a group of files that meet specified criteria. You have to slog through folder trees to find and tag the file(s) you wish to restore. Also, you can only restore files to the computer at which you are currently working. You can't sit at Dad's machine and tell Crashplan to restore data to Mom's machine. However, you can tell Crashplan to restore a file to your Desktop, a folder, or its original location on your current machine. You can do online backup for free using Crashplan, if you have a friend who's willing to share disk space with you. Another added benefit of using CrashPlan is that you can overcome one of the biggest drawbacks of online backup - the time required to make a full backup, or to restore your data. If you have multiple gigabytes of data, it can take days to transfer the data over the Internet, even with a high-speed connection. But if your friend lives near you, the initial full backup or a subsequent restore can be done much faster by going over to his place and connecting a standard network (ethernet) cable to his machine. Here's one more interesting point about CrashPlan. (This is a bit geeky, so feel free to skip to the end if your eyes begin to glaze over.) If you have your own web server running Linux, or a web hosting account with Linux shell access, you can install the free CrashPlan software on that server, and backup your Windows or Mac computer to it. Here are the technical details. So there's another free online backup option for you. Most recent comments on "Free Online Backup With CrashPlan"
a great Online Backup service been using for over a year got the 3yr. plan well worth the money ! Mozy Home is $6/month. With the 1-year plan you get one month free; the 2 year plan you get three months free. Been using Crashplan+ for a year now £40 and it unlimited storage, I use it for documents and .CR2 files, and have no issues at all, its a great service and when you edit a document crashplan creates a to do list then every 15 minutes backs up new or altered files, its a great service for the money.